Dzongkha, or Bhutanese (རྫོང་ཁ་ [dzoŋkʰa]), is a Sino-Tibetan language spoken by over half a million people in Bhutan; it is the sole official and national language of the Kingdom of Bhutan. The Tibetan alphabet is used to write Dzongkha. Districts of Bhutan in which the Dzongkha language is spoken natively are highlighted in yellow. The word dzongkha means "the language of the district"; kha is language, and dzong is "district". 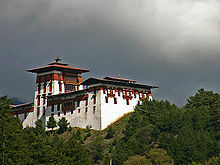 District-like Dzong architecture characterises monasteries, established throughout Bhutan by its unifier, Ngawang Namgyal, 1st Zhabdrung Rinpoche, in the 17th century. As of 2013, Dzongkha had 171,080 native speakers and about 640,000 total speakers. Dzongkha and its dialects are the native tongue of eight western districts of Bhutan (viz. Wangdue Phodrang, Punakha, Thimphu, Gasa, Paro, Ha, Dagana and Chukha). There are also some native speakers found near the Indian town of Kalimpong, once part of Bhutan but now in North Bengal. There are various ways of romanization and transliteration systems for Dzongkha, however all possible systems failed to represent the true phonetic sound. A phonetic transcription system known as Roman Dzongkha, devised by the linguist George van Driem, was adopted as the standard romanization system of Dzongkha by the Bhutanese government in 1991. Dzongkha is a tone language and has two register tones: high and low. The tone of a syllable determines the allophone of the onset and the phonation type of the nuclear vowel. All consonants may begin a syllable. In the onsets of low tone syllables, consonants are voiced. Aspirated consonants (indicated by the superscript h), /ɬ/, and /h/ are not found in low tone syllables. The rhotic /r/ is usually a trill [r] or a fricative trill [r̝], and is voiceless in the onsets of high tone syllables. /t, tʰ, ts, tsʰ, s/ are dental. Descriptions of the palatal affricates and fricatives vary from alveolo-palatal to plain palatal. Only a few consonants are found in syllable-final positions. Most common among them are /m, n, p/. Syllable-final /ŋ/ is often elided and results in the preceding vowel nasalized and prolonged, especially word-finally. Syllable-final /k/ is most often omitted when word-final as well, unless in formal speech. In literary pronunciation, liquids /r/ and /l/ may also end a syllable. Though rare, /ɕ/ is also found in syllable-final positions. No other consonants are found in syllable-final positions. When in low tone, vowels are produced with breathy voice. In closed syllables, /i/ varies between [i] and [ɪ], the latter being more common. /yː/ varies between [yː] and [ʏː]. /e/ varies between close-mid [e] and open-mid [ɛ], the latter being common in closed syllables. /eː/ is close-mid [eː]. /eː/ may not be longer than /e/ at all, and differs from /e/ more often in quality than in length. Descriptions of /øː/ vary between close-mid [øː] and open-mid [œː]. /o/ is close-mid [o], but may approach open-mid [ɔ] especially in closed syllables. /oː/ is close-mid [oː]. /ɛː/ is slightly lower than open-mid, i.e. [ɛ̞ː]. /ɑ/ may approach [ɐ], especially in closed syllables. When nasalized or followed by [ŋ], vowels are always long. Many words in Dzongkha are monosyllabic. Syllables usually take the form of CVC, CV, or VC. Syllables with complex onsets are also found, but such an onset must be a combination of an unaspirated bilabial stop and a palatal affricate. The bilabial stops in complex onsets are often omitted in colloquial speech. ^ a b "How many people speak Dzongkha?". languagecomparison.com. Retrieved 2018-03-15. ^ Hammarström, Harald; Forkel, Robert; Haspelmath, Martin, eds. (2017). "Nuclear Dzongkhic". Glottolog 3.0. Jena, Germany: Max Planck Institute for the Science of Human History. ^ "Constitution of the Kingdom of Bhutan. Art. 1, § 8" (PDF). Government of Bhutan. 2008-07-18. Archived from the original (PDF) on 2011-07-06. Retrieved 2011-01-01. ^ George, Van Driem; Tshering of Gaselô, Karma (1998). Dzongkha. Languages of the Greater Himalayan Region. I. Leiden, The Netherlands: Research CNWS, School of Asian, African, and Amerindian Studies, Leiden University. p. 3. ISBN 90-5789-002-X. ^ a b George van Driem (1991). Guide to Official Dzongkha Romanization (PDF). Dzongkha Development Commission of The Royal Government of Bhutan. ^ Driem, George van (1998). Dzongkha = Rdoṅ-kha. Leiden: Research School, CNWS. p. 47. ISBN 90-5789-002-X. ^ a b c d e f g h i j k l m n van Driem (1992). ^ a b c d e f g h i j k l m n o p q Downs (2011). ^ a b c van Driem (1994). ^ van Driem, George (2007). "Endangered Languages of Bhutan and Sikkim: South Bodish Languages". In Moseley, Christopher. Encyclopedia of the World's Endangered Languages. Routledge. p. 294. ISBN 0-7007-1197-X. ^ George, Van Driem; Tshering of Gaselô, Karma (1998). Dzongkha. Languages of the Greater Himalayan Region. I. Leiden, The Netherlands: Research CNWS, School of Asian, African, and Amerindian Studies, Leiden University. pp. 7–8. ISBN 90-5789-002-X. ^ Driem, George van (1998). Dzongkha = Rdoṅ-kha. Leiden: Research School, CNWS. p. 110. ISBN 90-5789-002-X. Traditional orthography and modern phonology are two distinct systems operating by a distinct set of rules. Downs, Cheryl Lynn (2011). "Issues in Dzongkha Phonology: An Optimality Theoretic Approach" (PDF). San Diego State University. Michailovsky, Boyd; Mazaudon, Martine (1988). "Lost syllables and tone contour in Dzongkha (Bhutan)". In Bradley, David; Henderson, Eugénie J.A. ; Mazaudon, Martine. Prosodic Analysis and Asian Linguistics: To Honour R.K. Sprigg. Canberra: Pacific Linguistics. pp. 115–136. van Driem, George (1992). The Grammar of Dzongkha (PDF). Thimphu, Bhutan: RGoB, Dzongkha Development Commission (DDC). van Driem, George (1993). Language policy in Bhutan. SOAS, London. Archived from the original on 2018-09-11.
van Driem, George (1994). "The Phonologies of Dzongkha and the Bhutanese Liturgical Language" (PDF). Zentralasiatische Studien (24). van Driem, George; Karma Tshering of Gaselô (collab) (1998). Dzongkha. Languages of the Greater Himalayan Region. Leiden: Research School CNWS, School of Asian, African, and Amerindian Studies. ISBN 90-5789-002-X. - A language textbook with three audio compact disks. Wikimedia Commons has media related to Dzongkha language.